If you’ve ever attempted to attach a large file to an email in Outlook file you’ve probably received a notification window alerting you that “The attachment size exceeds the allowable limit.” Even though it doesn’t tell you, the default file attachment limit in Outlook 2010 is 20 MB. What we’ll do in this How-to is change that limit to anything you want! However, keep in mind that your file attachment sizes will still be governed by the limits of your email service provider. 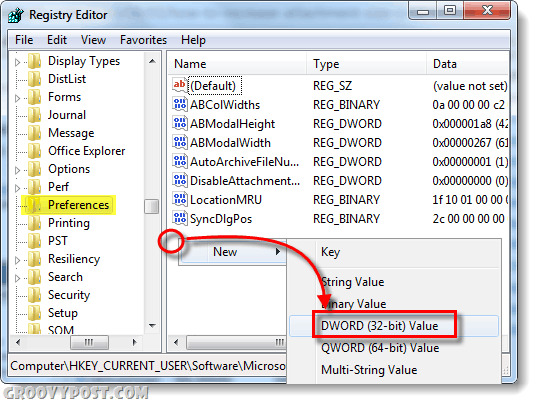 Right-Click an empty area in the right-panel of the Preferences key and Select New > DWORD (32-bit) Value. 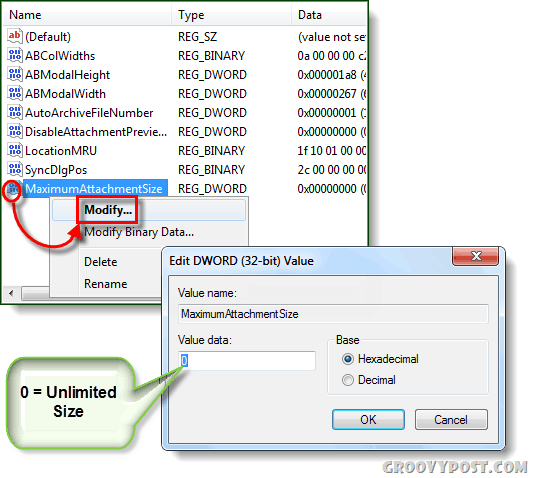 Right-Click the new MaximumAttachmentSize DWORD and Select Modify. The number you put into the Value data box will tell Outlook how big of a file attachment to allow emails to send. This size is determined in kilobytes. Here are some common numbers you can put in. Keep this in mind before you try to send a monstrous attachment to a buddy over at GMAIL. I think you missed the step where we add the title “MaximumAttachmentSize” to the new DWORD registry entry. I enter the modify string and closed and restarted outlook 2010 but was still unable to get a larger sizes to load onto my email, in my case I set the value to 10240. Mas mesmo que outra pessoa use outlook e não posso mandar nada maior que digamos 50mb? Se alguém tiver uma dúvida só me mandar um email no carlosfrohlich@ do hotmail, eu fi aqui e vou fazer uns testes hoje. Thank you so much for the clear and detailed steps!! God bless! I have a Windows 7 64-bit computer with Office 2010 and when I edit the registry, the entry for Preferences is not there? Is there something different on 64-bit computers? Thank you very much for the TIP! easy to follow and A HUGE LIFE SAVIOR!!! 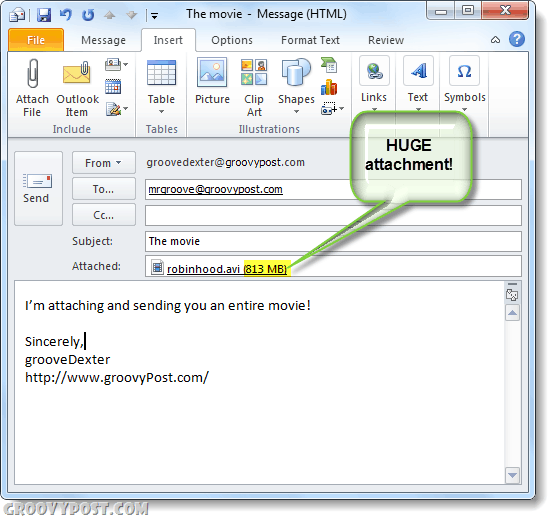 I am trying to How to Increase the Outlook Attachment Size Limit. 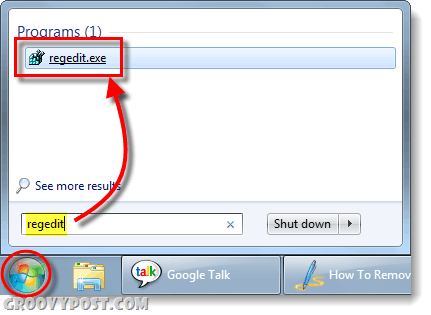 I get through HKEY_CURRENT_USER\software\Microsoft\ I kind not find Office which should come after Notepad. 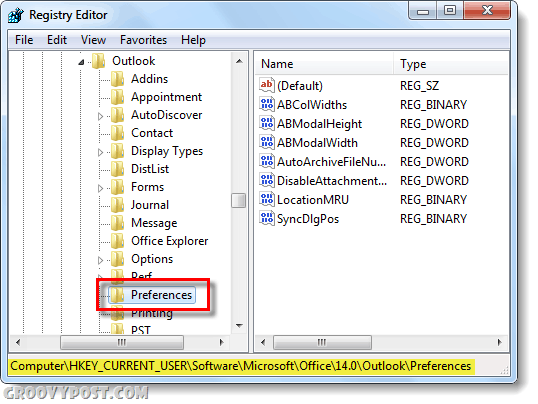 AFAIK there used to be a facility in Outlook Express for sending attachments as parts so that the receiving outlook express would joing them together. Zip can also be used to not only encrypt the attachment with a key (that you can pass over using another email, or a telephone call but it will also split the generated .zip into parts. And PAR2 for creating hashing value files that allow recovery of missing or damaged in transmission parts when you send data as a set of files – having (possibly) split files using 7zip, winzip par or just zip – see the help/manuals.